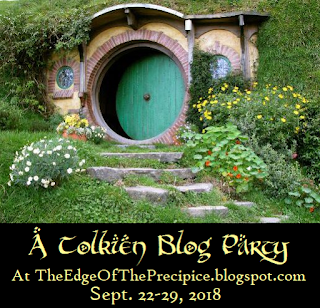 The 6th Annual Tolkien Blog party has started just as the Silmaril Awards are wrapping up! Today, I am participating in the blog tag for the party! Starting off with a hard one right out of the gate! Ooooh…. how to choose? Honestly, Two Towers has always been my favorite. It is the book I’ve read the most often, and when I was younger, sometimes I’d just sit down to read that one all by itself. I know that’s probably weird. A lot of people don’t like Two Towers because of the endless pages of Sam and Frodo plodding across Mordor… but, in the words of Bastian from “Neverending Story” “But that’s what I like about it!” I dunno, I found their one-foot-in-front-of-the-other struggle so much more relatable and compelling than the flashier heroics of other parts of the series. And then there was Helm’s Deep and everything about Rohan… and I was a rather horse-crazy kid, so Rohan and the Horse Lords have always had a special place in my heart. Some may desire the quiet of the Shire, or the peace of Rivendell, or the magic of Lothlorien… but me… I left my heart in Rohan. With Eomer. Oh, goodness, yes! I mean, how to choose? But seriously, my favorite subplots have always been the parallel stories of Merry and Pippin when they split up at Rohan. The way that they each “grow up” and see the sober realities of the world on their own is beautiful to behold, and I always enjoyed the way that Merry and Pippin had somewhat reversed experiences with greatness. Merry forms a deep bond with Theoden after Gandalf casts out Wormtongue and heals the king from the poisonous lies he’s been believing and then he gets to see the king return to a measure of greatness. Meanwhile, Pippin grows close to Denethor, the master of the mighty city of Gondor, who seems to have it all held together, but then witnesses his descent into madness due to the same kind of lies, and sadly, Denethor clings to those lies too tightly and allows them to destroy him. Hm… probably the theme of friendship and loyalty that runs throughout the entire Lord of the Rings. It is such a strong theme, and I love it. This tag is evil and cruel, making me choose these sorts of things. I guess I’ve always been a bit partial to Glamdring/Foe-Hammer! I’d rather be a Horse Lord of Rohan. Or an elf. But if Hobbit was the only option on the table, then yes. I would like to be a hobbit. But I’d be a disreputable specimen of a hobbit and go haring off on an adventure with the first wizard to stop by! Eowyn and Faramir, for sure! I even wrote a whole blog post about them this past February for Valentine’s Day! SMAUG! Dragons are my favorite forever. Even evil, villainous dragons. And Smaug is the ultimate standard for those! Look like? I mean, Arwen, I guess? And, I mean… I’m a LITTLE concerned that it thinks I have so much in common with Saruman and Sauron… more than with Bilbo, even… but… I mean… #yikes? If you want to try it (or, you know, procrastinate from something more worthwhile…) I found this particular test HERE. I… am pretty sure I’ve never read any books about Middle-Earth or Professor Tolkien that he didn’t write… so I’ve got nothing. I did direct the play The Hobbit and we used the script by Patricia Gray. I liked that one, but didn’t like how she decided to cut Thorin’s death scene from the end… as I find that kind of crucial to the plot and character development of Bilbo. Just a few of my favorites… and I’m being a REBEL and sharing MORE than ten! So there! Great observation about Merry and Pippin! For the first question, I don’t see why you couldn’t count LotR as a whole as one book. I used to be really bored by the “Frodo and Sam wandering through Mordor” parts of TTT and ROTK, but the last time I read them, they passed super quickly and I enjoyed them much more. Maybe I’m aging into them? If my heart didn’t belong to Boromir and Bard, it would belong to Eomer. I love Rohan best of all the Middle-earth lands. It’s so funny, because the questions I thought would be easy (favorite weapon, for instance) are the ones that are tripping people up, and the ones I thought would be hard (favorite theme) they’re just breezing through. Hee! Anyway, how cool you directed a play based on The Hobbit! Haha I’m sure I could have come up with more than 10 favorite quotes too, but I didn’t want to spend too much time on it. I didn’t have it on my list, but that whole exchange is great. It’s Gimli’s reply to Elrond when Elrond tells the Fellowship that they won’t be asked to swear to complete the quest. @Beth yes! I love that entire exchange! I also love Aragorn’s somewhat laughing rejoinder to Samwise when he tells him he thinks an agent of the Dark Lord would “look fairer and feel fouler,” “Meaning I look foul but feel fair?” They put half of it in the extended edition, but I wish they’d retained the second part and given Aragorn back his sense of humor. If the movies lacked one thing, it was Tolkien’s dry sense of humor he imparted to his characters…. Aragorn, for example, was never so gloomy/Batman-esque-broody in the books! Ah, Boromir!!! I love him to pieces. (I just wouldn’t prefer to live in Minis Tirith… personally). That is funny, but yeah, I guess themes are just easier for me to pick a favorite. Though the subplots one gave me some pause for a bit… but really, the Merry/Pippin subplots have always been one of my favorites. The play was SO MUCH FUN! We built a huge dragon and got it to “breathe smoke” even, which was cool. The students did a fabulous job with the whole thing. Yes! Merry and Pippin are marvelous. Their journey may not be as harrowing as Frodo and Sam’s… but they definitely have the widest range of adventures!